Chris Bombardier will be attempting to climb Mount McKinley (Denali) in a few months. This will potentially be his 4th summit in his pursuit of the Seven Summits challenge. 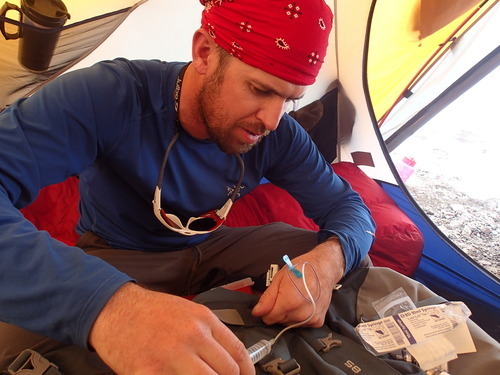 Chris, also from Colorado, already successfully completed Kilimanjaro, Elbrus, and Aconcagua. As if the feat wasn’t impressive enough, what makes Chris’ challenge even more difficult is that he suffers from hemophilia, a commonly misunderstood blood disorder. While on his summit trips, he also works with local hemophilia organizations to help raise awareness. He also helped set up a hemophilia clinic in Kenya during his Kilimanjaro trip. We recently caught up with Chris to learn more about his quest and how we can get involved. Tell me a little about your background and how you got into climbing. I got into climbing in a pretty roundabout way. I was born in Colorado and lived here until college. I skied and hiked a little bit but wasn’t really into the outdoors, I was obsessed with baseball. I left Colorado to play baseball in college and when I moved back I decided to get more involved in what Colorado has to offer. I have an uncle that has lived in the mountains for close to 30 years and he started talking about all the great outdoor sports he does and I had to try them all. I really feel in love with it and can’t get enough. What is the goal of your Seven Summits push? The goal of the Seven Summits started back in 2010 as more of a far off dream. I talked to my uncle about his Denali climb and we dreamed of climbing Aconcagua together someday. In 2011 I was offered the opportunity of heading to Kenya to help with a hemophilia clinic and decided I had to take advantage of being that close to Kilimanjaro. I was time to start turning this Seven Summits dream into a reality. I was a bit nervous to climb Kili. I had no clue how I would do with my hemophilia or with the altitude. Turns out neither was really an issue and I loved being up on the mountain. It took me awhile to get to my second peak. Funds were tight for quite sometime but fortunately I found some funding from a company called LA Kelley Communications and headed to Aconcagua. I had a blast on Aconcagua and after summiting there I didn’t want to lose my momentum. I did a small fundraiser shortly after Aconcagua and headed to Russia to climb Mt. Elbrus. Now I’m training for Denali! I’m super pumped about this climb since I have heard so many stories from my uncle about it. The plan from here out is Everest next spring, and depending on funding, Vinson Massif this winter or next and Carstensz Pyramid spring of 2016. How are you using this to raise awareness about hemophilia? How do you see the two as being connected? When I started dreaming of climbing the Seven Summits, the goal was more about seeing if I could do it. Not just because I have hemophilia, but just do it period. I didn’t really have a goal of raising more awareness about hemophilia especially hemophilia in the developing world until my first trip to Africa and climb of Kili. After college I worked in a research lab that specialized in hemophilia. Being a person with this disorder and working on it everyday was pretty sweet. I learned a ton about my disorder and how to set up the basics screening tests for it. I was offered the opportunity to help setup a basic diagnostic lab and clinic in Kenya in 2011 and it changed my view on life forever. 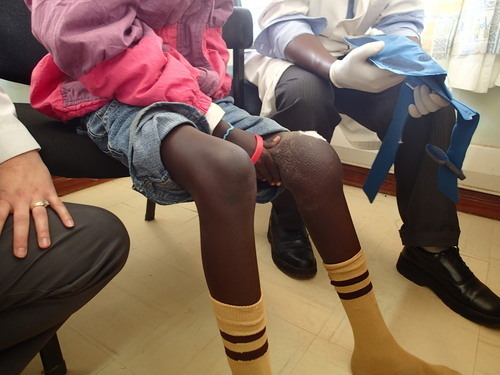 Here is the US, hemophilia is more like a condition you deal with but what I witnessed in Kenya was tragic. I saw young men with the same condition as me. They were completely crippled or close to death. 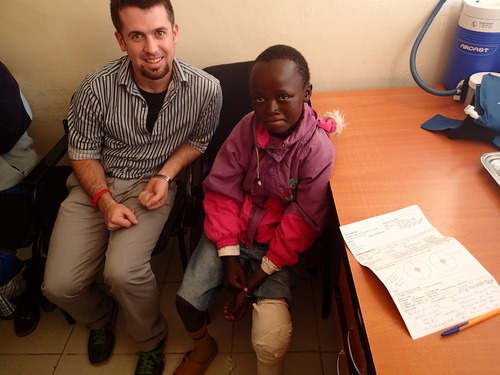 We spent two weeks getting the lab set up and meeting people with hemophilia before Kili. As I climbed I realized I needed to do more. I realized how lucky I am to be able to climb these peaks so why not use it to make others lives better. Since my first trip to Kenya my climbs have been used to raise money for Save One Life. They help support young men with hemophilia in the developing world. I have traveled back to Kenya twice more as well. We improved the lab and have successful diagnosed hundreds of patients in Kenya. An unintentional result of my climbs has been helping those with hemophilia in the US get more active. When I was growing up people with hemophilia were considered fragile. Many men my age didn’t participate in sports because of the fear of injury. With the new treatments for our disorder we can do more, we can shoot for our dreams! Yes playing football or hockey isn’t a great idea, but we can do way more than most people think. While on Aconcagua I actually came up with a program for our local hemophilia chapter called Backpacks and Bleeders. So far we have gone snowshoeing, rock climbing and hiking a 14er in the near future! With the rest of my climbs I want to keep up the momentum for Save One Life so they can keep expanding and helping more people with hemophilia. I also want to inspire some young men here in the states to go for their dreams, whatever they may be, and also for them to give back. If I can bring hemophilia closer to the mainstream that would be fantastic too! What’s the gnarliest experience you’ve had so far on this push? It’s hard to pick out the gnarliest experience I have had. It all seem like it out of a dream or something. I did have a pretty terrifying moment on Aconcagua when one of our team members stumbled backwards on our summit push and almost stabbed me with his crampon. We were at about 22,000ft and his crampon went through my pants but somehow didn’t break my skin. Even though I had medicine on board for my hemophilia and I might not have bled terribly bad, that could’ve been devastating. Gnarliest experience ever though was walking into the hospital in Kenya. It’s really hard to describe what I saw there. The smell was overwhelming. There were two people per bed, some laying on the floor. I couldn’t imagine anyone making it out of there alive much less with hemophilia. We did find a young man there, bleeding out from a surgery that didn’t even know he had hemophilia. He was in rough shape but fortunately we found him and got him the correct treatment. Somehow he made, which I still can’t believe, but this image will never leave my mind. How about the most inspiring? The disparity in treatment for hemophilia around the world is insane. In the developed world you have kids and young adults like myself living a pretty normal life. Granted its not always easy and we definitely have our struggles too but in the developing world they have nothing. Most don’t even make it to adulthood. Save One Life, the nonprofit I am raising money for with my climbs does a ton to change this. Their main goal is to have people sponsor children with hemophilia in a developing country. With the $22 a month sponsorship we can keep these kids in school, pay for transportation to hospitals, provide them with some education about hemophilia. The families and children we support are much to poor to afford any of these things. I think people can really get behind what we are doing. You can visually see how different my life with hemophilia is compared to them, just because I was born in the right place. I currently have a donation page set up at http://www.saveonelife.net/chris-bombardiers-denali-quest.php where people can donate.